The Scottish Parliament will today debate the new Climate Change Bill for the first time. The Bill intends to outline the action Scotland will take to meet the objectives of the Paris Agreement. The Stop Climate Chaos Scotland coalition is calling for far greater urgency in Scottish ambition, including a significant increase in action during the next 10 years. The debate comes in the week that over 180 of the UN’s climate science experts from the Intergovernmental Panel on Climate Change (IPCC) are meeting in Edinburgh. In October 2018, the IPCC published a report which calls for radical transformation of transport, energy and food systems by 2030 if the world is to avoid further catastrophic temperature rises. However, the Scottish Government’s Climate Bill has pledged almost no increase in action in the crucial period to 2030. The Parliamentary Committee overseeing this Bill has heard a wide range of evidence urging MSPs to recommend an immediate step change in Scotland’s action to tackle climate change and to put in place the policies required to bring down emissions in the next decade. “The Scottish Government is failing to tackle climate change with the necessary urgency. The Bill going through Parliament currently commits to almost no increase in action between now and 2030. “MSPs must use this debate and the forthcoming parliamentary process to increase Scotland’s action, particularly in the next decade, and map out the concrete measures that will cut climate emissions from transport, housing and food production over the next ten years. 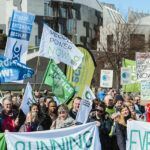 Ahead of the debate, Stop Climate Chaos Scotland will stage a Climate Rally and photo stunt outside the Parliament on Tuesday 2nd April from 12.30-2pm. It will be themed ‘Running Out Of Time’ to reflect the urgency of the situation.